The 101 free maps listed below were hand-built by Tom Herbertson, based on the driving directions provided by Pete KJ in his book Base Camp Denver: 101 Hikes in Colorado’s Front Range published by Imbrifex Books in April 2019. 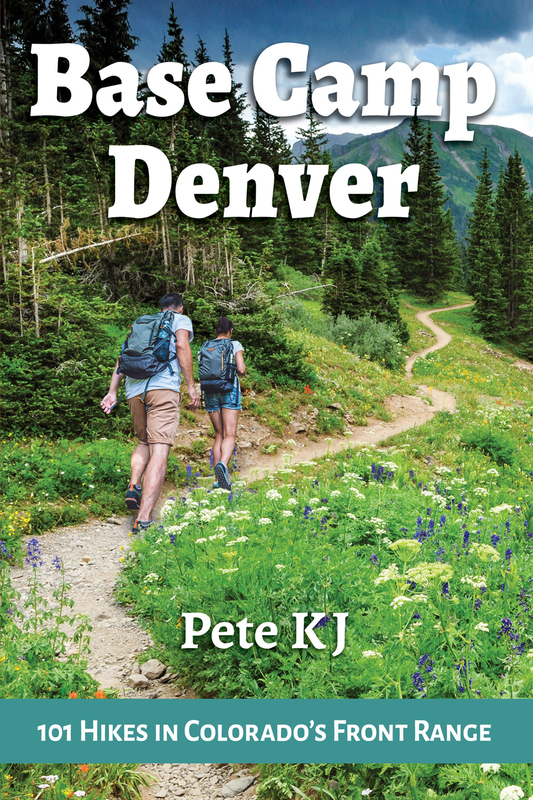 All of the maps start in downtown Denver at the Denver Tourist Information office located at 1575 California Street and provide the best driving routes to each of the 101 trailheads described by the author in the book. Special Note: When these maps were created, some of the roads were subject to snow and seasonal closures and and so some of the routes might not always follow the directions in the book to the trailheads, because the underlying Google database prevents us from creating maps on roads with construction or seasonal closures. But the route shown on the maps is as close to the author’s instructions as we could get them. You can use these maps as is, or add your own additional points of interest by registering for a free account on RoadTripAmerica.com. If you don’t already have an account, you can register here. The account is free and allows you to customize, save, and share maps. Please read the instructions below this list for more info on how to use, customize, save, and share your maps. Please note that each map includes the described route from the book and 3-4 of the RTA attractions found along it. You can add additional attractions from the book or points of interest of your own choosing to the maps. After registering, you will be able to customize any and all of the 101 maps listed above by navigating to “Advanced Maps” (in the navigation bar at the top of every page) or clicking here. RTA Map Library — this is where you will find the list of maps that correspond to the routes in the book. All the routes described in 101 Hikes in Colorado’s Front Range are labeled like this: West BCD-##-Hike Name (where ## represents the hike number associated with that map). So, the first one you will see in that list is called “West-BCD-01-Denver to Pawnee Buttes Trailhead.” The easiest way to see all 101 routes is to use the bcd in the keyword search box. If you click on the blue line under the number next to the word “West” it will open the link to the route. 1. If you click on the blue flag labeled “1” you will find a description of the route and details about long it takes to drive this route. 2. The icons that have little colored flags are RoadTrip Attractions published by RoadTrip American contributing writers. They are not specifically related to Pete KJ’s hiking guide, just a quick means of getting to the trailhead. Click on the number link. At this point, you can add your personal Custom Places and then save whatever is on your screen as a map. Just click the “Save Map” button. The map’s name will now appear in the “My Maps” box in the left-hand column. To create a new map based on the original RTA Library Map + some new places that you’d like to add, you will be using the RTA Custom Maps “Waypoints” system. The Waypoints system is explained in greater detail on the Advanced Maps page — look for MAP INSTRUCTIONS. And if you need help with any of this, please get in touch with us via email to map.center.support@roadtripamerica.com. You can also join the map discussion on the Trip Advice Planning Forum.